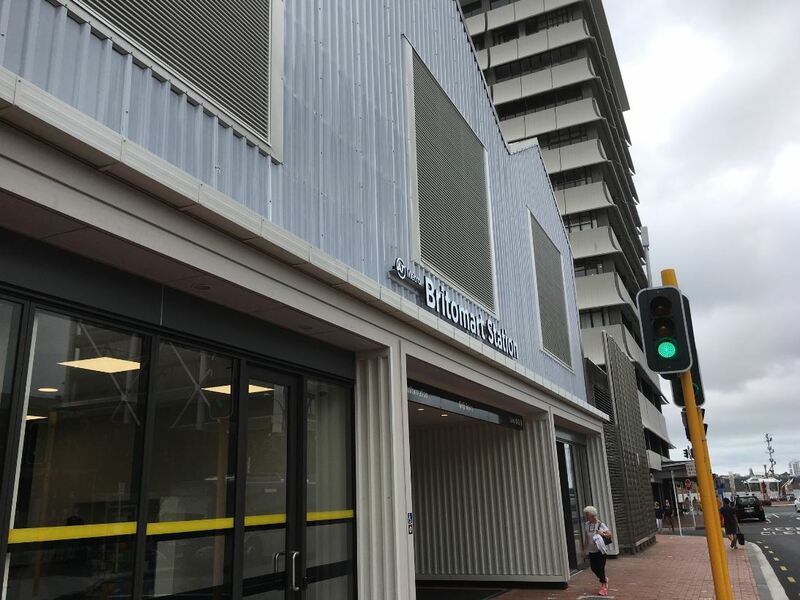 The new temporary entrance at Britomart, which I’ll refer to as ‘the shed’ and is needed while the City Rail Link is built under the old Chief Post Office (CPO), is now able to be used by the public. 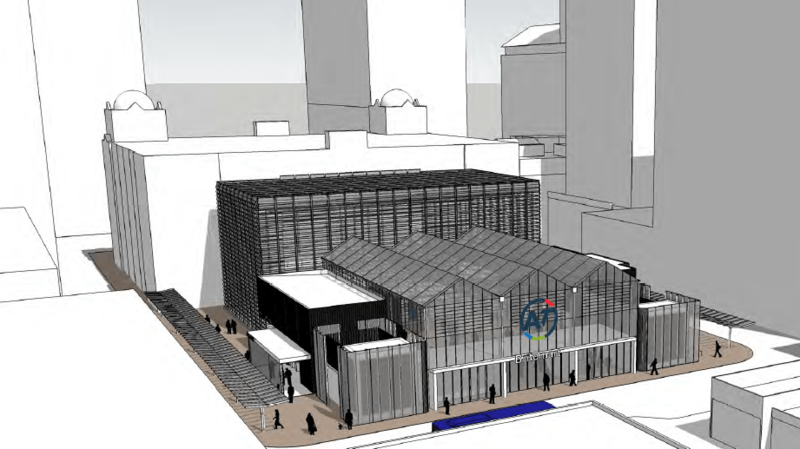 From next week the CPO will close making the shed the main entry to the station and the only way to access it at the western end – the entrance under the EY building is unaffected. 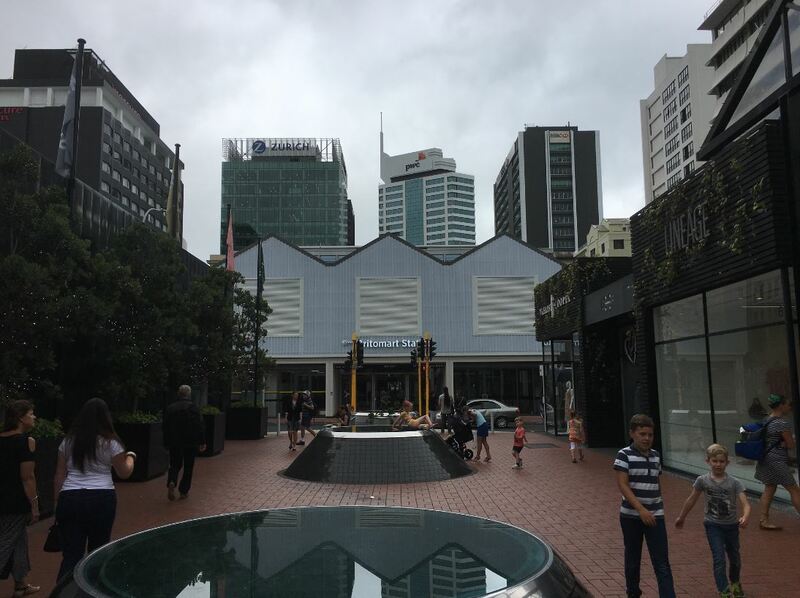 I haven’t been though Britomart yet this year but Cam Pitches kindly grabbed some photos for us. The material is translucent though letting a lot of light in as shown in this image from AT when iwi blessed the entrance last week. I wonder the choice of material was to stop the place suffering from becoming a glasshouse effect during the heat of the day. 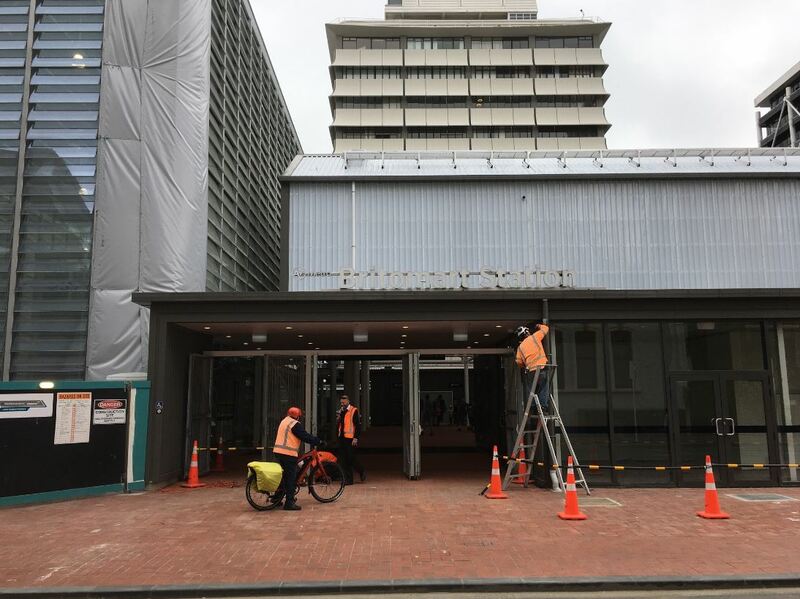 With most people arriving at Britomart heading south towards Customs St, the most heavily used entrance will see passengers pouring out onto Galway St. Here’s what that entrance looks like as finishing touches are put on. One thing to note is that there are no escalators from the ground level down to the lower concourse, only stairs or the elevators. The entrance certainly looks temporary from the outside but as Luke mentions, and what I felt looking at it during construction, it does feel light and spacious. It will also be fascinating to see how long it lasts after the CRL is complete. Temporary structures tend to have history of sticking around a lot longer than intended with a great example being the slug on Queens Wharf. The CPO Queen St doors will close after the last train on Monday night (for three years) and the new entrance will be in operation from first thing this Tuesday. Are there any immediate plan to make Galway (and maybe Tyler St). pedestrian only zone? Or is AT going to wait until someone gets injured? The buses were taken out of there a number of months ago, not sure if they are coming back after the CRL opens or not, bearing in mind Queen St outside Britomart will be pedestrianised by then. The best thing about this project is that the vile little carpark at the back of the station had to be removed to accommodate it. May we never build a downtown at grade car park for a station again. (I’m assuming that they have staff members positioned to read and take notes, so they should be onto it Pronto!). It wasn’t a car park, it was a porte cochere, i.e. a drop off and pick up zone. They are useful! So maybe not right at that location in that way, but there will always need to be something similar near an entrance to Britomart. The big improvement is rolling straight out of the exit into the Pavilion shops. Well, you have a road – but definitely better than the carpark. It’s nice that they’ve left a few centimetres between the door and the road for pedestrians. Designed by the same buttmunch who planned for 4 lanes of cars near the Aotea Station entrance, perhaps? Does nobody in AT have any experience with crowds? Looks so much better from the inside. A relief. The cladding should use more lasting material such as glass, concrete or wood. The choice of iron cladding looks cheap and feels like a factory warehouse. Its a temporary entrance, and the material used is low cost translucent fibreglass sheathing – suitable for the 2 years of the building. Spend money on the permanent building! I just got back from EU a couple of weeks ago… not sure what to say; I am a little depressed to be back but this website is really so encouraging to see the topics being discussed and solved. Its all not fast enough really for me though. But good to see huh. Just on The Auckland New District Plan; is this really a big improvement on the current plan, do people of this forum think the new Zones represent a new ara of affordable housing. It’s a huge improvement on the old plan but needed to go way further. I’ve been there: it is nice, light and airy. But no cafe or food. Is this going to be addressed I wonder? As far as I can tell as a mere observer, the only food business that’s ever done OK in Britomart is Subway which has a plum spot for the “breakfast in a hurry” crowd, right at the most direct door to/from Quay Street. And perhaps also the cafe in the middle, which has persisted for a long time – although it’s never seemed *super* busy. Everything else always seemed to be stumbling along at best. To be honest I think there’s probably enough coffee and food available very near to Britomart. 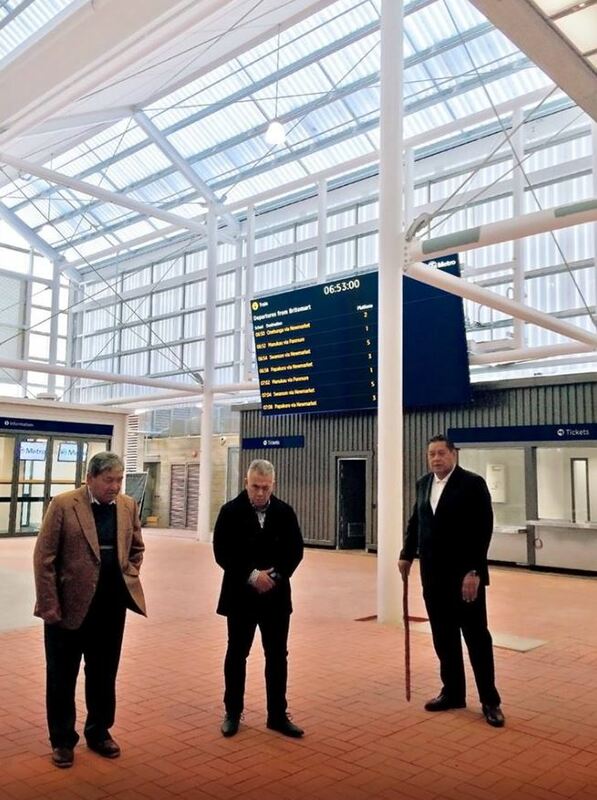 Better for it to work superbly as a train station and see if that draws more businesses closer in later. It’s not a great look, or use of space, to fill a nice airy foyer with half-empty kiosks and a handful of businesses that seem to be permanently on their last legs. is this going to be as temporary as the cloud, the viaduct carpark or the lifting bridge? No, because the further works (CRL) are funded. 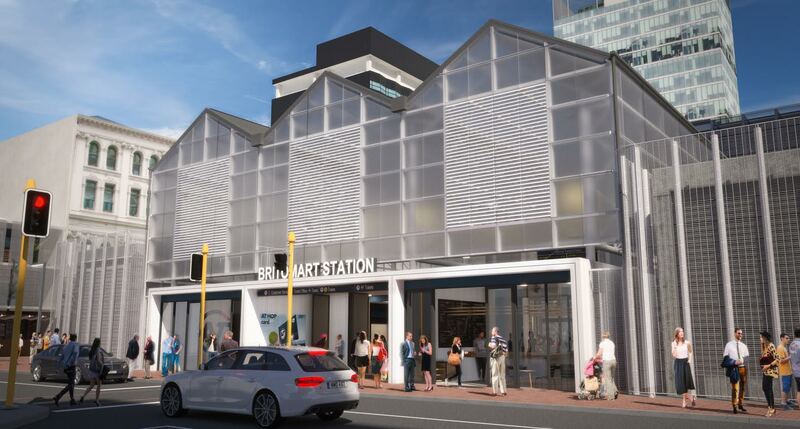 In fact, the main Britomart Building will presumably reopen soon enough once the tunnel and building strengthening work under which will now start is done. At that time, this new rear building could conceivably stick around, yes, but it would be an add-on, not a replacement anymore. The regular entrance will be reopened and the stairs gone well before any trains run on those tracks, indeed before any tracks are laid. Once the CPO tunnels are built and the CPO rebuild finish they will open immediately, not least to get back to receiving the retail and office revenue asap. So the CPO tunnels don’t extend to the area of the stairs? Chris they will, but not during this stage of construction so that that space can be used to access the station while the mining and underpinning of the old CPO takes place. You might be thinking about it back to front. The stairs and the access to the platforms are entirely within the glasshouse annexe. This is so the actual CPO building can be closed as they under pin and undermine it to build the tunnels, and renovate the upstairs st the same time. When that is finished in stage one they can reopen the CPO and remove the temporary stairs, which happens well before the tunnels are extended or used. It was a quick, affordable and usable solution. All it needs to be for a temporary solution. I like the new sign, guess that will be reinstalled in the refurbished station. Hopefully very temporary and then pulled down in quick time with our crl tunnels in place. Went through it today. Light and airy, yes. Cheap and nasty – absolutely. But I know its temporary and cutting costs to spend elsewhere. And overall it will be perfectly functional. Personally I like the dairy-shed functionality of the building. 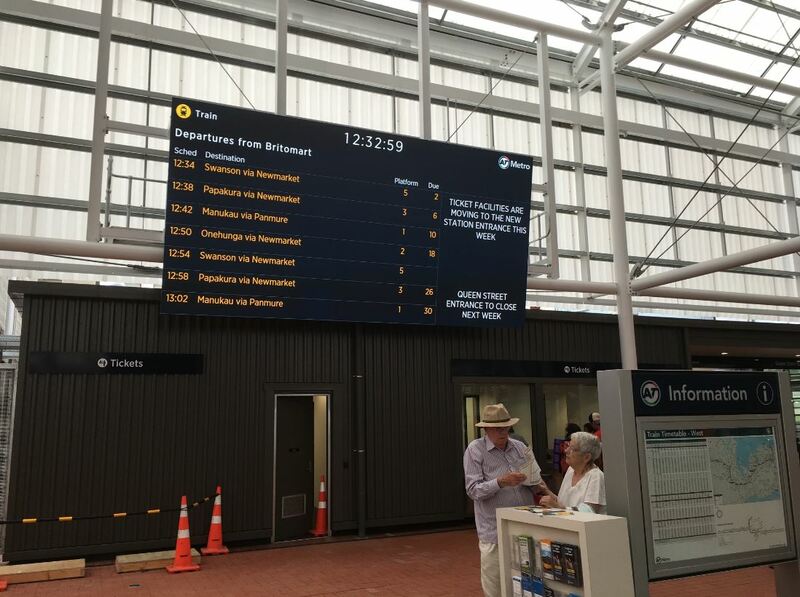 Good to see: Onward Auckland. I love the 10 minute frequency of the Western Line trains. We use the trains so much more now. If we are going downtown, we get the train – if uptown, the bus is quicker except in the peak times. Stoked that works have started on CRL however this area will be a zoo and safety hazard with ped vs car /bus/ truck. Remember too that there is an alternate access in the east…Takutai. With escalators too for those that need or prefer them.